1. What are good hammock brands? 2. Are Hammocks good for your back? 3. How are you supposed to lie in a hammock? 4. How far apart should the posts be for a hammock? 5. Is it better to have cotton or polyester hammock? Nowadays, we usually pursue the busy lifestyle with a tight schedule and hardly spend time relaxing. After exhausted working days, you need a peaceful place for laying your back; maybe inside your home or in your garden, with me, it’s the backyard. Choosing an excellent hammock will be a smart investment, which helps you to experience the relaxing and comfortable feeling. If you don’t know how to choose the most comfortable hammocks for backyard relaxation, keep reading my whole article, and you will have the perfect selection. What is a Brazilian style hammock? Brazilian style hammock derived from the state of Ceara (Northeastern Brazil). These hammocks are made primarily from cotton woven fabrics and other materials like polyester. Brazilian hammocks have various types and sizes. They are comfortable and durable, feel like a warm cocoon. They are hung and pitched with a deep sag that brings the backyard relaxation. The Brazilian style hammocks are popular around the world thanks to their unmatched comfort. This product of Hammock Sky with the tightly woven cotton threads and cocoon effect make it one of the most comfortable hammocks you can find in the market. You will have a euphoric feeling like lying on a soft sponge thanks to the appropriate rate of two materials (65% cotton and 35% polyester). If your skin is sensitive to the fabric, you can ease it by using an additional blanket. However, in general, it’s fine with most people. Notice that it should only be air–dried or hand–washed with mild detergents unless you want the colors to be damaged. 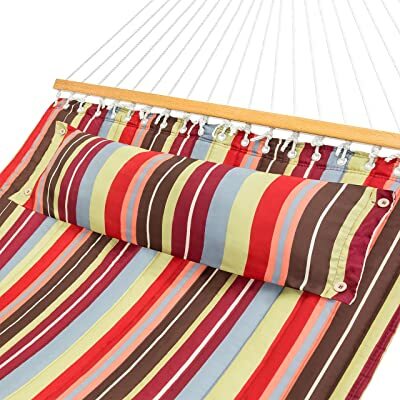 It’s best to keep this hammock out of the long-lasting sun exposure because the sunny element can degrade the fabric. Furthermore, this Hammock Sky is friendly with children and pets. The solid fabrics have enough absorption to take children and pet’s abuse. Due to a free carry bag, you can transport it easily and conveniently. You can leave it in the backyard, hang it on the porch, bring it to the cottage, take it on your camping trip, etc. In brief, if you don’t have any special need, just want a comfortable two-person hammock, this Brazilian Hammock Sky the an ideal choice for you. The rope hammocks have 2 spreader bars at the heads of the hammock, which can enhance the maximum width. Spreader bars that can help you experience the extreme comfort with the large lying area. The spreader bar is also the biggest difference to the Brazilian hammocks, which are designed to wrap you like a cocoon. This type of hammock is primarily made from rope with additional mattress and pillow. You can use it as a swing bed. Some hammock are also made from cotton instead of rope to create the softer and more comfortable feeling. You can also adjust these hammocks’ height to whatever you prefer thanks to the “O” ring and attached chains. For this amazing price, how could you complain about this Stansport hammock? The Caribbean colors are bright and funny in woven fabrics that allow for stretching. The colors are also vibrant and stand well to the sun exposure. What I like most about his hammock is that it dries quickly after getting wet from the rain, perfect for outdoor use. The solid spreader bar and twisted cotton rope make you have comfortable, relaxing hours when you lay on it. With not too small, not too big dimension – 78 x 37 inches, it’s suitable for one-person use (below 240 pounds). Because it is single hammock, you can’t expect it to be wide. Also, the fabrics are also soft enough for your sensitive skin. Its Amazing price and excellent quality will satisfy any hard-to-please customers’ requirement. 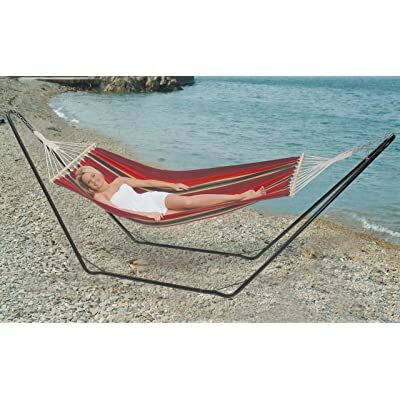 This Stansport Bahamas Hammock is a perfect and enjoyable place for relaxing with music and reading books. Let’s enjoy your life with the afternoon breeze or lay under the stars. This is an amazing hammock for your garden or outdoor yard. This Quilted Double Hammock is like a cocoon mattress; it can take your weight evenly. However, it may soak moisture like a sponge and get moldy if you don’t keep it away from rain. Hence, I advise you to keep it out from unpredictable weather for the best longevity. You can trust the great durability and good quality of this product. The quilted fabric is quite comfortable and smooth on your skin. It’s also breathable on hot days. Don’t worry about its width. With the dimension of 74×54 inches, I guarantee that it’s wider than your expectation and two large adults (350 pounds) can lay comfortable on this without any problems. A storage bag can help you to store and transport conveniently. This not only is a well – made hammock but also has an affordable price. I’m sure you will experience the most comfortable feeling. Why don’t you pick up one for your family? There are several reasons why it’s worth buying. The first is that this hammock is extremely soft and comfortable, which will make you feel easy to fall asleep. The Vivere double hammock is simple – designed to be set up without any tools. You just have to assemble the steel stand then hang your hammock onto it. You can also adjust the height you want. With 3 various fabric: cotton, sunbrella, and polyester, you will have the larger selection more than most other hammocks. But cotton is still dominant in the collection thanks to its fantastic features. Particularly, another convenience for busy people is that you can wash it by washing machine without any damage, it’s a huge plus, indeed! Don’t worry about transporting due to its stand. The hammock carrying case will help you to solve the problem. You can bring it to anywhere you want! The price is affordable, but the quality doesn’t suffer in the slightest. This product will surely satisfy you more than you expected. When you lay in this Vivere double hammock, you will feel the most relaxed and never want to get out. However, if your backyard is quite narrow, this isn’t an ideal hammock due to its place requirement. The design of this space-saving stand double swing hammock can help you to set up quickly and relocate easily to any destinations you want. It also has an adjustable height feature; you can adjust the height to whatever you want, to fit any places. The polyester and cotton fabric will enhance the durability and create an optimal comfort to this Sorbus double hammock. However, the cocoon of this hammock can make it too hot under the sun. Using it in the cooler weather will bring the best result of relaxation. With high quality, colorful cotton, weather – resistant nylon, this hammock will offer you the premium comfort without a rip or stretch under pressure. 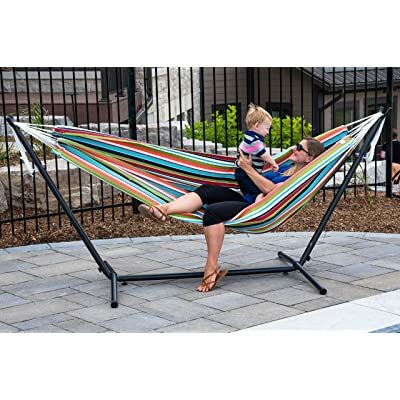 The superior strength stand, the large hammock with 144 – inch long, 52 – inch wide dimension and up-to-450-pound weight capacity can comfortably accommodate 2 adults. A sturdy and portable carrying case can help you to transport it easily and conveniently. In brief, if you have a strong demand for the relaxing hammock, this Sorbus double hammock is another good option. This is a comfortable furniture for your outdoor or indoor space. Let’s enjoy wonderful free time after a busy week. Laying on the soft hammock, getting lazy and sleep on a summer weekend will make your life more beautiful. Enjoying your lazy days with Sunnydaze Cotton rope hammock is a good idea. This hammock can withstand any weather conditions thanks to acrylic fabric and inner poly quilting. The steel – coating stand also has rust resistant. Thanks to its great durability, you can use this hammock anywhere anytime without weather limitation. Don’t worry about complicated assembly. You don’t need to prepare any tools, and it also doesn’t require any experience and skills. Just set up the stand with some simple steps and hang the hammock onto it, then enjoy. With the weight capacity of 275 pounds, it can fit you perfectly no matter whatever your size is. However, the color is easily faded if you put it under the sun for too long. Therefore, you should take care of the hammock by bringing it indoor after using. For an all-in-one product like this, you will have the most comfort after hard – working days. Imagine how you feel when lying in a slightly swinging hammock, in the little windy garden, reading a book, listening to your favorite songs, and then falling into a nap . Wow, sounds nice, doesn’t it? Here I recommend you some prestigious hammock brands such as Hammock Sky, Stansport, Vivere, Sunnydaze Décor, Sorbus. Hammock Sky is well-known for supreme-comfort, high – weight capacity products like Hammock sky Brazilian double hammock, large Brazilian hammock chair, XXL hammock chair swing. In addition to the high – quality products, if you aren’t satisfied with their products for any reason, they will refund your money. Stansport is popular with most consumers regarding durable and comfortable products: Bahamas single cotton hammock, Brazilian hammock, and stand combo. Stansport always cares for customer’s comment and improve their products to meet all customers’ requirements. Vivere is a famous hammock brand with many awesome products like Vivere cotton hammock combo, solid pine wood hammock combo, double polyester hammock combo. With the quality proved by many consumers, you can trust in using their products. 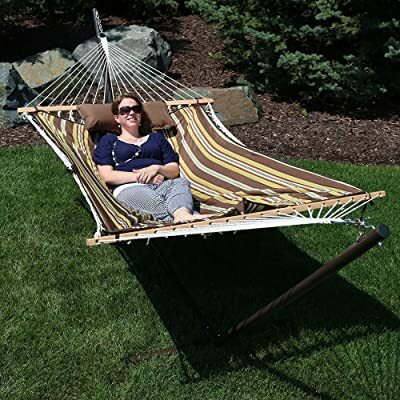 Sunnydaze Décor is one of the best manufacturers with high – quality hammocks: Sunnydaze universal multi-use heavy-duty steel hammock stand, Sunnydaze hanging Caribbean extra large hammock chair. In addition to high quality, their product price is also budget-friendly, fits most consumers’ pocket. As you know, sleeping in hammocks brings some great benefits. That can help you to fall asleep faster, have a deeper sleep. It offers you the peaceful, relaxing feeling. Hammocks also give you the best sleeping position for blood circulation. However, while lying flat on the back is the ideal position for sleeping, lying in hammocks put you in position with the curved spine. For those who have back pain or any pains relative to the spine, hammocks are not ideal for lying long period. Your body position is relatively flat by aligning with the middle of the hammock. Your body’s weight will be distributed well – balanced across the hammock’s width. This way makes your body comfortable, evenly but it’s also dangerous due to the tipping risk if you don’t keep your body balanced. This is the most comfortable position with 30-degree shifting of your body when lying in a hammock. It makes your body relaxing without any problem, even when you are in a deep sleep. This is also the ideal position for sleeping with no pressure. However, it will not be effective with your tightly pulled hammock. Why shouldn’t you lie in a straight line? Because the diagonal position can keep your hammock flatter and you will get more support from this. Or when you sleep deeply, you will be wrapped in the hammock, and you can’t fall out of this. This way also provides the optimal comfort to your body, but just a short time. If you keep this long position time, your body will feel weary and uncomfortable. Hence, you can’t sleep in a hammock in this position. The ideal distance for hanging a hammock is about 2 feet greater than the length of the hammock, maybe 13 – 15ft apart from point to point (a foot less for single hammock). You can measure from ring to ring. If the distance is longer, you can adjust and increase the height a bit. And the height of hanging hammock may be at least 3 feet (0.9 m). At this level, your hammock will have appropriate sagging. Each type of material has different strength. The cotton is soft and all-nature. It’s a breathable material, suitable for those who have sensitive and vulnerable skin. But cotton is less durable than polyester. If you want to choose a hammock for indoor using, cotton hammock is highly recommended. The polyester hammock is the better choice for outside using. It can resist the sun, rain or moisture in long periods without any problems. It also has greater durability than cotton. If you tend to use your hammock outside, the polyester one is more appropriate. In general, which is better depends on your using purpose. Relaxation in our rush lifestyle is extremely important, which will make your life more beautiful and help you to maintain work-life balance. A comfortable hammock may help you to do this. From the beneficial information of my article, I hope you can make the right purchase. Don’t scrimp and hesitate to pick up the best one for yourself. You will experience the wonderful feeling. Finally, thank you so much for your reading. 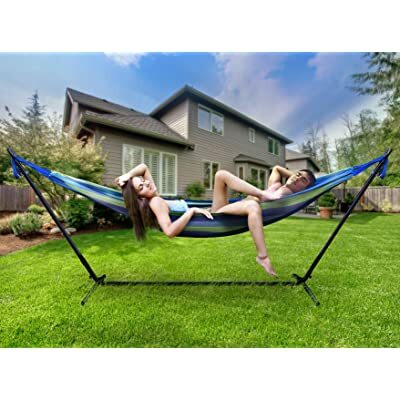 If you feel my article of “The Most Comfortable Hammocks For Backyard Relaxation” is informative and helpful, don’t forget to click the like symbol and share with your friends or relatives. And if you have any questions, let us know by leaving in the comment section.